The first individual ladder component of this event will run from Friday, February 10th at 10:30 am UTC to Sunday, February 12th at 10:30 am UTC. The secondary component of this event - Unwavering Resolve Leaderboard - will run from Sunday, February 12th at 11:00 am UTC to Monday, February 13th at 11:00 am UTC. For more information on the leaderboard event check out Unwavering Resolve Leaderboard. 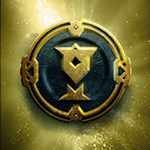 Possessing this prestigious reward grants the elite access to The Unwavering Resolve Leaderboard Event.